Jaguar E-Pace Performance, Engine, Ride, Handling | What Car? Before we get into the nitty-gritty of how the car drives, we need to address the elephant in the room: its weight. Underneath the E-Pace’s designer suit the E-Pace is basically a Land Rover Discovery Sport. True, the engineers have shaved off a few pounds through liberal use of aluminium, but the E-Pace still tips the scales at a hefty 1.8 tonnes – around 85kg more than the larger F-Pace. Unsurprisingly, then, the 178bhp 2.0-litre diesel model isn’t exactly rapid. Floor the accelerator and, even once the slow-witted nine-speed automatic gearbox has decided on a ratio, you accelerate with all the urgency of an asthmatic runner. Things improve once you've built up a few revs but, even so, the E-Pace never feels as urgent as equivalent versions of the BMW X1 and Volvo XC40. There is an even less powerful diesel, the 148bhp 2.0-litre unit, which is available in front-wheel drive and can be had with a six-speed manual gearbox. Around town, its pace is perfectly adequate and – given some encouragement – it doesn’t prove frustratingly slow at motorway speeds. Things are helped by its manual gearbox, too: the automatic being so sluggish. Ultimately, though, the 178bhp unit is the pick of the range because its performance is more flexible. Meanwhile, if you want a diesel and performance is your primary concern, there’s a 237bhp option, but it’s expensive and not as economical as the others. The range-topping 298bhp 2.0-litre turbo petrol engine goes some way to injecting some serious pace into the line-up. 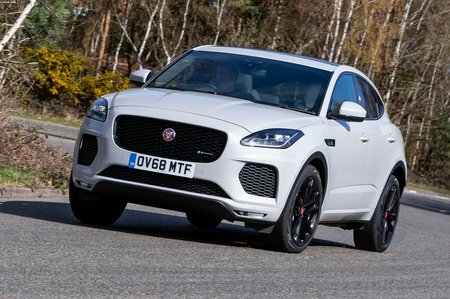 It’s lighter and revvier than the diesels and imbues the E-Pace with the performance you'd expect from a sporty SUV – just don’t expect it to win a drag race against a Porsche Macan. Also, should you plan on regularly exercising your right foot, be aware that this is a 35.3mpg car in official tests; you’ll struggle to achieve more than 25mpg in the real world. The 247bhp petrol version, meanwhile, is also very punchy and feels a lot sharper and smoother than the diesel variants. While cheaper than the range-topping petrol, though, it’s still pricey. As for the 197bhp petrol, it’s adequate for mooching around, but feels strained if you ask for a sudden increase in pace. Although you can get the E-Pace on 17in and 18in wheels in the lower trim levels, we’ve so far only tried versions on the whopping 21s, as well as the 19in and 20in wheels that are standard on SE and HSE respectively. Even with 20in wheels, the E-Pace isn’t horrendously firm and only crashes over the worst potholes. However, you do get jostled around quite a bit along pockmarked and beaten-up urban roads. The ride doesn’t settle down on the open road, either; things are far less settled than in an XC40 on similarly large wheels, even on the motorway. This can get tiresome after a while – something to consider if you’re only planning a brief test drive. 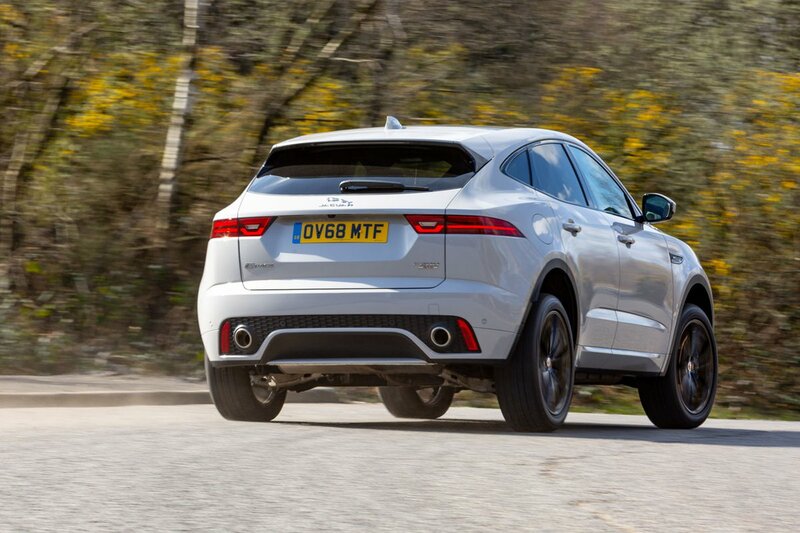 Meanwhile, 21in wheels should most definitely be avoided; they make the E-Pace thump over potholes and jostle you over surface imperfections. Adaptive dampers are available (we have yet to try them) and that might improve things. Smaller wheels are likely to give a generally smoother ride, too. The trouble is, you might think the E-Pace looks a bit dumpy without its wheel arches properly filled. If there's one area Jaguar can always be relied on to deliver, it's handling. And the E-Pace lives up to that reputation – to a point, at least. It’s taller and heavier than rivals such as the X1 and Audi Q3, so isn’t quite as eager to turn in to bends as those cars. Nevertheless, it still stays pretty upright through tight twists, grips well and stays neatly balanced. Around town, that steering can feel quite heavy, making the E-Pace harder work to manoeuvre than some rivals, including the XC40. However, along faster, twisting roads, that heft actually gives you confidence. Most versions come with all-wheel drive that predictably offers plenty of grip, although you can opt for the entry-level diesel engine with front-wheel drive. 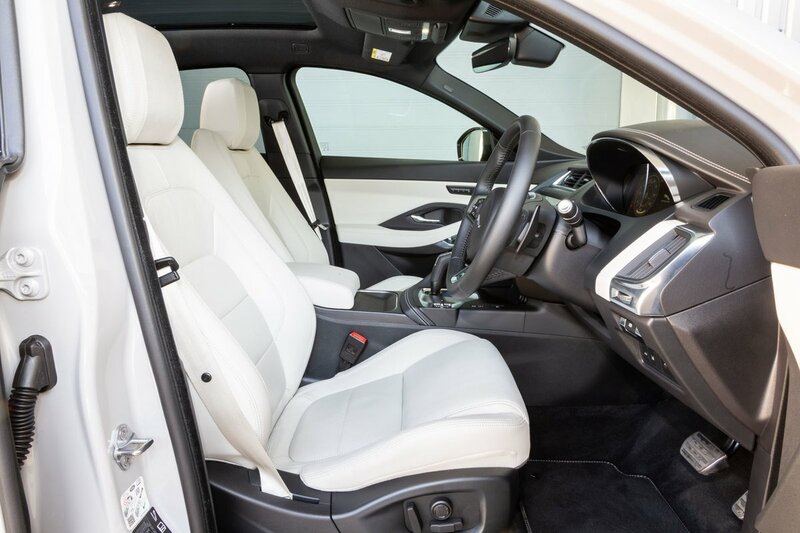 In that guise, the E-Pace’s handling isn’t quite so assured; the steering wheel squirms under your hands if you accelerate eagerly through corners – something that you don’t find in the four-wheel-drive versions. That said, it is only in quick corners, or in bad weather, that you really feel the benefit of the four-wheel drive system. You feel a surprising amount of vibration through the diesel E-Pace's pedals and steering wheel. You could argue that this is just about acceptable in the Discovery Sport – a car built on utilitarian principles – but, in a Jaguar, you expect a little more polish. The gruff engine note is still audible at a steady 70mph cruise and there’s some wind noise around the mirrors and windscreen. Still, there isn’t much road noise, so the E-Pace is, overall, a quieter cruising companion than the Q3 or X1. Of the diesels, the entry-level 148bhp 2.0-litre engine is the quietest, but the petrols are unsurprisingly smoother and quieter than all the diesels. It’s just a shame that they don’t sound a bit sweeter when you rev them out.